In the summer of 1996, I was between high school and college, at a summer camp for the performing arts. Quite a few of my fellow campers were vegetarian or vegan and had strong opinions on living without meat. After the four weeks with them, I thought making a switch from being an avid meat eater to a vegetarian would be pretty easy, seeing that I was about to move out on my own and start college in the fall. I went cold turkey. I will have been vegetarian now for twenty years this summer. This blog post describes my journey as a vegetarian for two decades, and what I have learned. I did a lot of vegetarian junk food eating. My first year in college I gained the freshman fifteen, mostly due to skipping the meal and doubling up on desserts. All desserts were vegetarian! (This was well before the maple-bacon dessert craze.) I developed an allergy to raw apples and raw carrots at this time which caused my tongue to tingle and my throat to swell up (this allergy is stronger in high birch pollen season), and I managed to skip lots of salads because of grated carrots mixed in with the lettuce. I weirdly developed an aversion to oranges during this period too, because peeling them left a residue on my fingers. I managed to talk myself out of most healthy options and aim squarely for the dessert. I reasoned that because I had stopped eating meat and fish, I should eat more dairy, as a protein substitute. I had a lot of cheese, yoghurt, milk, ice cream and the like. Seven years later, I moved to Paris. Being a vegetarian in Paris wasn’t so bad. I ate my fill of brioche, croissant, pain au chocolat, and cheese. Boy did I eat the hell out of French cheese in 2003 and 2004. I went to the street market in front of my house once a week and made good friends with the marchand de fromage. I had coulommiers, morbier, crottin de chèvre, fromage de chèvre frais, beaufort, bleu d’auvergne, brie, reblochon, camembert, you name it, I ate it. I preached the gospel of unsalted french butter to anyone who came to visit. There was one small tiny little problem. My adult acne was out of control. My skin was constantly breaking out. I also got sick very often, contracting a nasty cold or flu at least once a month. The worst was the first flu that hit me, a few months after living in Paris. I was so ill that I had an alarmingly high fever and had to sit in the bath to cool off. I went to the pharmacist and they prescribed me something with sulfa drugs that I had an allergic reaction to on top of the flu. I had hives and had to sit in an ice bath of oatmeal to make it through the worst days of the illness. My thought was that I wasn’t getting enough protein as a vegetarian, so I increased my intake of dairy and eggs, yoghurt and quiches, anything that I thought would help my beleaguered immune system. I went to a hacker conference in Berlin in 2005 with an American friend. A long time vegetarian, she mentioned that she had recently cut out dairy and her acne had cleared up. My acne had been bad since I was 17 and had never let up. Before moving to France, from the age of 18 to 23, I had seen seven dermatologists and tried 15 different medications, topical and internal, ending up at the dreaded Accutane (a nasty drug, with nasty side effects, first developed as a drug for skin cancer). Nothing helped. By the time I moved to Paris at 25, I had given up trying to clear up my acne and just covered it up with makeup. After seeing my vegetarian friend, and hearing about how her long time acne had cleared up, I contacted another friend, a nutritionist, and asked her to put together a reduction diet for me, with dairy added in at the very end. She made me a six week plan, and when I returned to Paris, I embarked on the fun journey of food allergy self-research. My acne cleared up, slightly, by week five. On week six I added back in the dairy, and my acne broke out vigorously. I experimented with goat milk, and sheep milk, both of which made my acne flare up again. 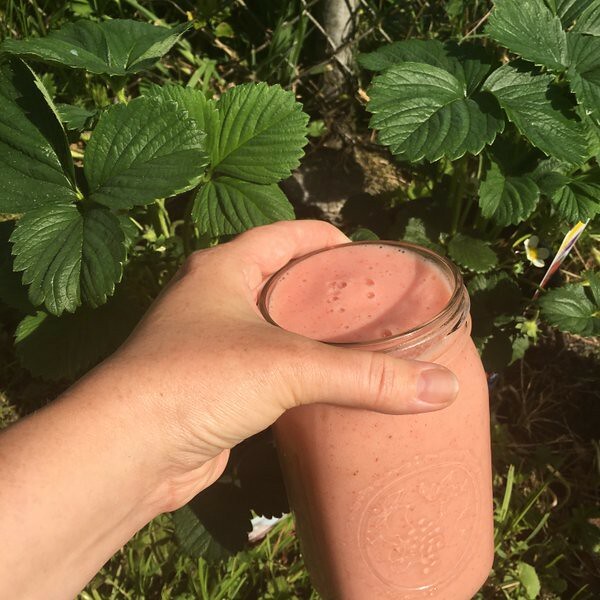 I noticed that even with trace amounts of dairy in processed food, one or two days after eating the offending particles, I would break out again. I developed a bitter rage towards all of the dermatologists and doctors who had never once even suggested that my acne might be related to a food allergy. Three or four months after living without any dairy in Paris, I noticed that I hadn’t caught even one cold. This was in sharp contrast to my monthly nasty cold and flu illnesses while still eating dairy. I knew they were related. The dairy had not only caused skin problems, but had also caused my immune system to be compromised. I was now vegetarian non-dairy. Navigating Paris as a vegetarian had been easy, but you can’t tiptoe around butter in French cooking. 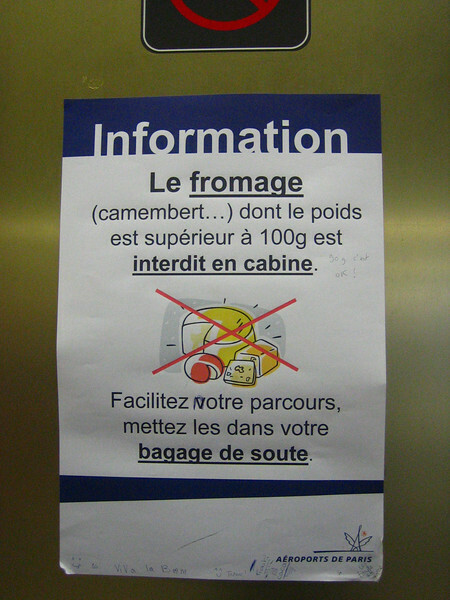 I once argued with a waiter at a Parisian café that butter was indeed a dairy product. He was convinced otherwise. I learned to bake non-dairy desserts, and really got into baking even more than before. I went down a delicious, but not exactly healthy, non-dairy baked goods rabbit hole. I started using one of those Clarisonic face scrub things, and it definitely helped to reduce my acne scars. I still use one to this day to wash my face. I moved to Berlin in 2006. I added more nuts, nut butters, tofu and eggs to my diet, reasoning that minus the dairy, I still needed to make up for a lack of protein in my diet. Berlin is a very vegan friendly city and became even more so in the eight years I lived there. I had my regular spots: Asian restaurants with their fried tofu dishes, sushi places (avocado maki, cucumber maki, oshinko maki, kanpyo maki, inari), vegetarian and vegan restaurants that popped up all over town, and the best cake you have ever tasted, that just so happens to be vegan. When veg friends would come to visit me in Berlin, I would take them on a whirlwind smorgasbord tour of the city’s happening vegetarian hotspots. Vegetarian and vegan restaurants in Berlin would open and close at a frighteningly fast pace. From one week to the next, one of my favorite places would close its doors, only to pop up again with the same chef, a new name, in a different part of town. My cooking routine while living for eight years in Berlin had a very predictable rhythm. I would cook a vegan curry with fried tofu at home, using red curry paste, or yellow curry paste, and a can of coconut milk, served on rice. I made pho from scratch, and added homemade slabs of seitan, baked in my oven with olive oil. I made stir fries with olive oil served on rice. I made stir fries with pan-cooked egg noodles. I often baked one banana bread each week. I perfected a sinful four egg, non-dairy, lemon pound cake. I made a seitan-o-greatness at least once a month, often frying up slices as breakfast “sausage”. I tested a dozen non-dairy “cheese”cakes and found a clear winner. To take it to the next level, just add a bit more lemon juice, up to a third of a cup, and if you like, put fresh raspberries or blueberries, or sliced strawberries in it before you bake it. Make a crust for it out of crushed speculoos cookies. It is a solid reason to buy a proper springform pan. I might be getting slightly sidetracked by the noms, but you have to try making this vegan lemon cheesecake. The big change that happened while I lived in Germany, was that I injured myself to the point of not being able to run. Ever since junior high school, I have always been a runner. If anyone said “oh you jog, that’s nice” I would snap “no, I don’t jog, I run.” I ran cross country in junior high, high school (seventh at counties one year, and almost ran in the California state meet twice), and in college for two years (NCAA ranked weirdly enough, even though our team was rag-tag and badly coached). I always ran. I ran usually at least two days a week, usually a minimum of 10 miles per week. I loved the blissed out zen feeling that hit me after about mile three or four. Running was my zen time, my exercise, my sanity, and it turns out, my ability to eat anything I wanted without gaining weight. When I injured my foot in the early months of 2010, I had run a half marathon, and was training for a full marathon. The problem was, I was training on a treadmill because the streets and sidewalks were treacherously covered in ice for months that winter. I ran my mileage gearing up for a marathon almost exclusively indoors. I suffered a very painful overuse injury in my foot, largely from the repetitive motion on the treadmill and from wearing cushioned and angled shoes (traditional running shoes), and from running with the wrong gait. I couldn’t walk or put weight on my foot without excruciating pain for three weeks. I went to doctors and had multiple xrays, but there were no hairline fractures, just my swollen foot in terrible, piercing pain. I read all I could on foot injuries, and runners that overcame them and on ultra marathon runners. I read Born to Run by Christopher McDougall. I read The Barefoot Running Book by Jason Robillard. I read Run Barefoot Run Healthy by Ashish Mukharji. I read Natural Running by Danny Abshire. I read Barefoot Running Step by Step by Ken Bob Saxton. I read Eat and Run by Scott Jurek. I read Finding Ultra by Rich Roll. (I recommend Born to Run, Run Barefoot Run Healthy, Eat and Run, and Finding Ultra. My local public library carries all of these except Run Barefoot Run Healthy, so get reading.) 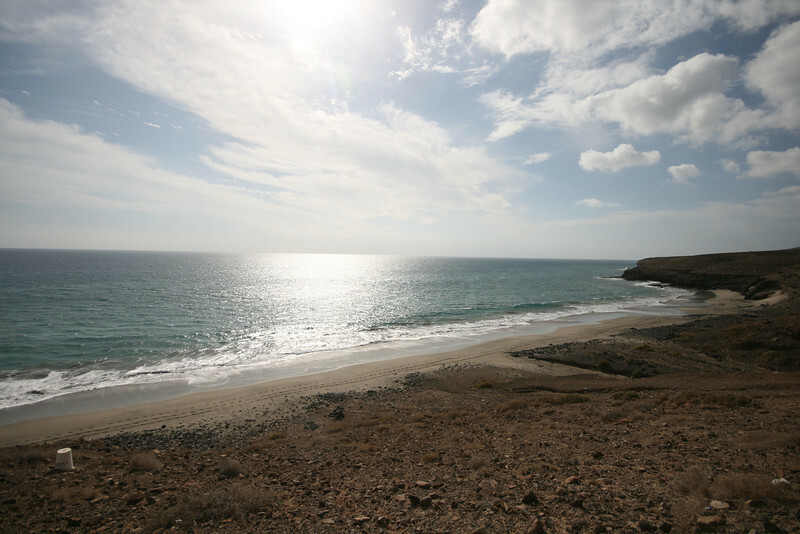 I switched to barefoot, flexible, minimal shoes as my daily street shoes, and even traveled to the Canary Islands to run barefoot on the beach and completely barefoot on the clean and warm sidewalks. It was winter once more and back in Berlin the sidewalks were covered in ice and snow. The other German tourists on the Canaries camped out immobile on towels and chairs on the beach. I joyously bounded past them barefoot in the sand with a perma-grin plastered on my face. I had so much fun from running again, that I went back to the Canaries three weeks later for a longer visit and more barefoot running. My running recovery was slow and painful. The first year, the foot pain in my problem foot would flare up after one mile. I changed my running gait, retrained my footfall and how often I picked up my feet, taking those characteristic short light steps that barefoot runners employ. I tried out many brands of “barefoot” running shoes, eventually settling on whatever was roomiest and cheapest and flatest that season. When not running I wore super flexible shoes with little to no cushioning, and in the summer months, very flat cheap flip flops. My chronic back pain went away as a side effect of switching to flat, flexible, uncushioned shoes with a roomy toe-box. Five years after my injury, it took four or five miles for the pain to flare up when running. I tried to replace running with lower impact sports. I never really was much of a cyclist, and I found myself depressed when fighting for my space in a lane in the city swimming pools of Berlin. 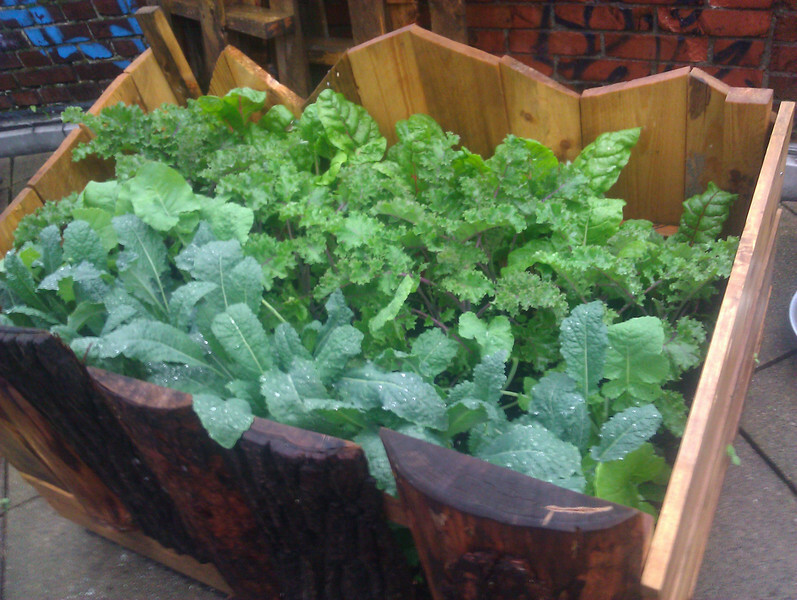 On the positive side of things, I grew my own kale in a hacker community garden in Berlin and got into green smoothies. Kale is traditionally only available in grocery stores in Germany after the first frost. 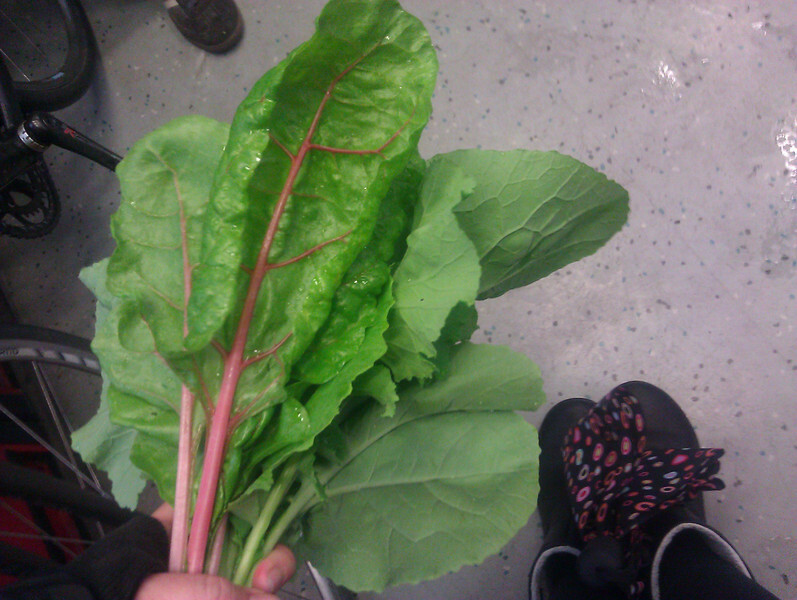 I carried home heaping bouquets of red russian curly kale, siberian kale, lacinato (dino) kale, mustard greens, and rainbow chard on the S-Bahn public transit twice a week and blended them into huge smoothies with banana and lemon juice and other fruits. But the lack of running, and the continued junk food vegetarianism caught up with me. I left Berlin to travel for a year, and on an epic road trip across the USA for the whole month of June in 2014, I ate my way through the fried (vegetarian) food of the back roads of America. I had fries, fries with salad, fries with ketchup, fries with mustard, fried okra, fried pickles, fried onion rings, and fried onion rings on a burger bun with fries on the side. I drank a lot of beer, having missed hoppy beers after ten years in Europe. I had a beer at local breweries across Tennessee and Colorado and everywhere in between. I sipped session ales like hops were going out of style. When I wasn’t drinking alcohol, I had root beer at every chance. After living in Europe for a decade I missed root beer with a passion. When I got somewhere more populated, I ate my way through the vegan junk food in the specialty stores. I had many packs of Tofutti cuties. I tried all the flavors of Coconut Bliss, a brand of non-dairy ice cream that had not been out before I moved to Europe. I ate tons of those vegan candy bars by Go Max Go. Running was still painful, and I twisted my ankle part way through the road trip shortening the long hikes I had hoped for in Arches National Park, Yellowstone, and the Grand Tetons. I went to Costa Rica for two months, as part of the traveling year. I had lots of refreshing “naturales con agua” — fresh fruit blended with water and ice. I learned to open my own pipa coconuts with a machete. 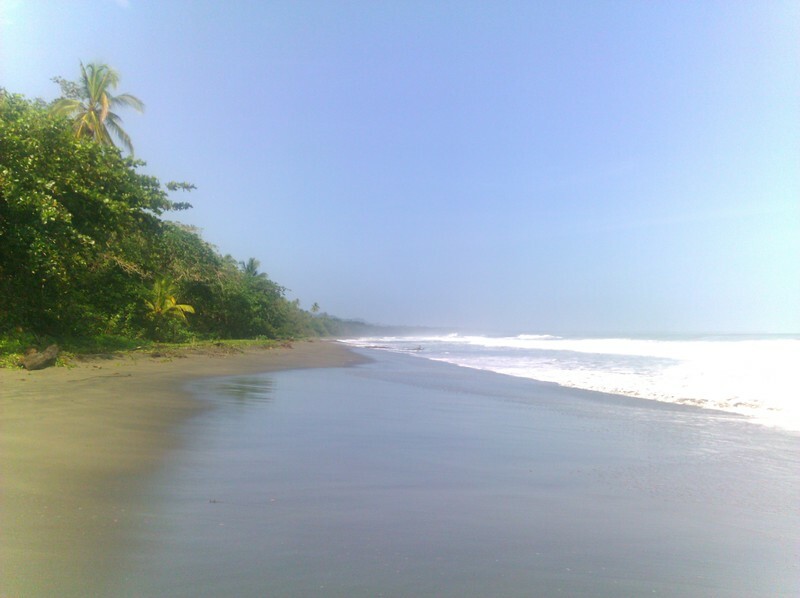 I ran completely barefoot on an empty black beach that stretched off into infinity, dotted with palms, and touched by beautiful but strong Caribbean waves. There was no one around, but my foot pain still crept in at mile four or so, even when concentrating on my running form. It had been four years since my injury, but I still felt that running was no longer mine. If you are running on “normal” commercial running shoes, now is the time to switch, before you get injured. Learn about your feet, strengthen them by walking in shoes with little to no cushioning, shoes that are flexible, with lots of room for your toes to spread out and flex, or no shoes at all. Try running and walking short distances completely unshod–no shoes or socks at all–on a variety of surfaces. Figure out how to adjust your footfall before it is too late. The weight didn’t come off in Costa Rica. Mostly I ate fried plantain, platanos fritos, and beans and rice cooked with oil. A friend taught me to make corn tortillas by hand and traditional Costa Rican Gallo Pinto with locally grown Culantro Coyote, a local herb that tastes like a stronger version of cilantro. I squeezed local sour citrus Limon mandarino on rice. After two months in rural Caribbean Costa Rica I traveled on to Hawaii for a month and a half. The onslaught of vegan junk food once again consumed my diet. I ate through the specialty vegan items in the Hawaiian stores, and tried every fancy fatty vegan item on menus from Kailua-Kona on the Big Island to Kaneohe on Oahu. I moved to Seattle one year ago. I gained so much weight on my one year of travels, that I didn’t fit into any of the clothes I had left Germany with. I knew something had to change. I did some reading which showed that diet is more important than exercise in losing weight, with diet accounting for 75% of weight loss and exercise for 25%. Somehow I stumbled on the High Carb Low Fat (HCLF) Vegan people on YouTube. High Carb Low Fat Vegan is sometimes also called a Whole Food Plant Based Diet. The HCLF people stress that there is no calorie restriction when you eat this way, and you should eat as many unprocessed starches, fruits, vegetables, and greens as you like. Keep the fats low, no fried food, and don’t add olive oil or other oils to your food. I gave myself a challenge to quit coffee and alcohol, and go HCLF Vegan for the month of May in 2015, with no calorie restriction. I did it and lost 10 pounds. I haven’t gone back to coffee, and have been light on the alcohol since then. I’ve also continued eating HCLF vegan, mostly, since then. My current staples are bananas, (four or five in a smoothie in the morning, with various combinations of greens and/or fruits), rice (white or brown), steamed potatoes, sweet potatoes (baked or steamed) and lots of other fruits and vegetables and greens. I eat these foods in all kinds of delicious combinations. I stopped using oil and margarine in my cooking. When I eat out I still eat sushi, delicious piles of it (skipping the fried vegetable tempura rolls and skipping the fatty extra mayonnaise sauces). If I eat out somewhere else, I order a couple of sides of rice to go with my meal, or potatoes with no fat (steamed, boiled or baked), and have lemon juice on them. I eat a lot larger volume of food to add up to the calories I used to eat, and I don’t count calories. I eat until I am full. It turns out that you don’t need animal proteins. You don’t even need to combine vegetables to make a complete protein. Even just potatoes alone contain all of the protein and essential amino acids required by an adult or a child. Rice also contains all of the protein and essential amino acids required. You will be very healthy, very fit, and very strong consuming between 30 and 80 grams of protein per day, an amount naturally obtained from eating High Carb Low Fat Vegan. Carbs are your friends. Carbohydrates don’t turn into fats. Fat consumed is stored on the body as fat. The sugar in carbs is not turned quickly into fat by our bodies. This is a pernicious myth that is strongly refuted by scientific evidence. Eat carbs, as unprocessed plant based starches, and regain your health. After going down a bit of a research rabbit hole, (The Starch Solution by John A. McDougall, The China Study by T. Colin Campbell, watching the excellent Forks over Knives documentary — on Netflix right now, and the equally excellent documentary Cowspiracy — also on Netflix), I have a point of view. I am no longer “just a vegetarian, just because”. I have been a vegetarian for almost twenty years, but this last year has been the year I woke up. One of the HCLF vegan YouTubers often says “eat like you give a f@%k.” She has a point. A high protein/low carb diet, whether Atkins or Paleo or Keto (high fat/low carb), is very detrimental to your health. With high protein, you will lose kidney function and you are setting yourself up for osteoporosis and kidney stones. You might lose weight in the short term, but you will gain it back and you are not doing your kidneys any good whatsoever. Animal proteins are also loaded with dietary acids. When you eat them, your bones release alkaline material to try to balance your body’s pH. You are once again setting yourself up for osteoporosis. There is a particular irony that consuming milk and dairy (and beef, chicken and eggs) causes you to screw up your bones. By eating meat, fish or dairy, you are setting yourself up for heart disease, heart attacks, type 2 diabetes, putting yourself significantly more at risk for cancer, and strokes. As I was eating a high fat, highly processed junk food vegetarian diet, I was setting myself up for obesity (and all of the heart disease related issues), bowel problems, and suppressing my immune system. Eating high carb foods, high unprocessed carbs with little to no added fat, can heal your body. It is never too late to switch to a vegan high carb low fat diet. and reduce your caffeine and alcohol intake. Do not limit your calories, but instead eat until you are full. If you like munching on food all day like I do, munch on steamed potatoes, or rice, or whole oatmeal, or corn, or bananas, or fruit. I went all in on HCLF vegan in May of 2015, and have continued since then. I sleep better, my digestion is better, I am no longer constipated, I have higher energy, and I lost weight and kept it off. If I can do it, you can do it. If you have any questions, need HCLF recipes, want to do some scientific paper reading and exchanging and debating with regards to veganism, high carb eating, protein, B12, etc, I am here for you. You can email me at fabienne at fabienne dot us. You can twitter at me. You can talk to me in person in Seattle. We can watch Forks over Knives together, or Cowspiracy, or read The Starch Solution together. Let’s have a couple of High Carb Low Fat Vegan potlucks this month in Seattle. If you chose frozen bananas, use fresh strawberries. If you use frozen strawberries, use fresh bananas. If you want, you can use both fresh bananas and strawberries. If the stems on the strawberries look fresh and green, leave half of them on the strawberries. Strawberry greens are high in vitamin C and completely edible. You can remove the thickest part of the base of the stem on the kale if you want. Save one strawberry as a garnish for the top rim of your glass to make your smoothie the classiest. Blend it all until there are no more chunks. If your blender can’t deal with the greens and the frozen stuff, thaw it all a bit before you hack it to bits. Sometimes your food processor can deal with this smoothie better than a wimpy blender. Or just get a high powered blender (I got mine barely used for $200 on ebay). Potatoes (steamed or boiled or baked without added oil), rice (brown or white or sushi or basmati or thai or wild rice, eat it all), bananas, sweet potatoes, yams, acorn squash, butternut squash, banana squash, whole oats, dates, fruit, greens, quinoa, corn, corn meal (try making your own corn tortillas! ), beans (low sodium, no added oils or fats), lentils, peas, fresh boiled soybeans aka edamame (low salt), coconut water (not coconut milk), water, whole juices (the fewer the ingredients, the better), lime juice, lemon juice, fresh herbs, dried herbs, spices, apple cider vinegar, homemade hummus (no oil), nutritional yeast, pepper. Avocados, seeds, maple syrup, coconut sugar (available at health food stores, great in banana smoothies), tahini, tamari, hot sauce (low sodium better), peanut butter powder (peanuts with the fat removed, also great in banana smoothies, I like the brands PB2 and Santa Cruz Organics), balsamic vinegar, rice vinegar (unseasoned is less salty, I like Marukan), simple unprocessed tofu, simple unprocessed tempeh. Meat, beef, pork, chicken, turkey, cheese, fish, seafood, bacon, olive oil, vegetable oils, butter, milk, cream, yoghurt, ice cream, any dairy products from any animal, heavily processed foods (cookies, crackers, chips, processed breakfast cereals, candy), processed soy products, isolated soy protein, textured vegetable protein, white sugar, processed wheat (commercial breads, etc. ), isolated wheat protein, very salty foods, fatty processed foods (baked goods etc), nuts (very few can be ok, but none that are roasted in fat and none that are salty. peanut powder with the fat removed is ok, see above), salt, soy sauce. This entry was posted	on Thursday, April 28th, 2016 at 21:15	and is filed under food. You can follow any responses to this entry through the RSS 2.0 feed. You can leave a response, or trackback from your own site. There’s a book called “Whitewashed” about milk. You might find it interesting.